We've put our top 5 Adelaide Hills activities together to keep the junior explorers, zookeepers, art, craft, nature and animal lovers entertained and active these school holidays! Spend the school holidays unplugged (literally) at the Woodhouse Activity Centre’s drop and go days. Suitable for ages 5-15, big and little explorers will take part in challenges, obstacle courses, craft and nature play on the expansive grounds at Woodhouse with qualified group leaders in charge. Book into as many or as few activity days as you like, all with a wet weather contingency plans in place, so rain or shine, participants get the benefit of being active these holidays! Calling all junior zookeepers! Experience the life of a professional keeper in the Adelaide Hills at Warrawong Wildlife Sanctuary getting up close and personal with gliders, possums, kangaroos, pythons, parrots and so much more. Check the Warrawong Wildlife Sanctuary Facebook page for real time availability. Wander around the farm at your leisure, cuddle cute baby rabbits, chicks and guinea pigs, go on a pony or tractor ride; or let the kids marvel at one of the many daily education shows in barn. From milking a cow, to bottle feeding baby lambs and even holding a python there is tons to keep the kids busy these school holidays. Let your little artists unleash their creative sides at these cool workshops at the beautiful Hahndorf Academy. From sculpture carving, impasto knife painting, kaleidoscope and zine making these classes are taught by qualified professionals in a fun and educational environment. 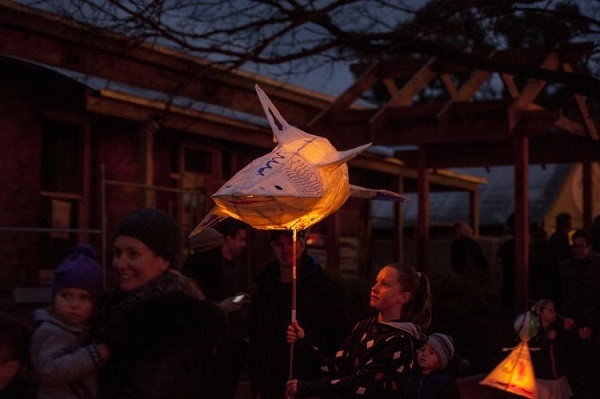 In preparation for the Hahndorf Winter Lantern Festival in August there are also multiple lantern making workshops, where participants can make their own candle lit lanterns to parade down the street at the upcoming festival. Explore the gardens and gullies of the beautiful Mount Lofty Botanic Gardens learning about plants and history as you go, take a picnic or join one of the many free guided walks and tours. Mount Lofty Botanic Garden. Image credit: Mardi Zeunert.